Christina Seid, the current owner of Chinatown Ice Cream Factory, started working at the store as a kid with her father. Egg pudding. Green Tea. Durian. Pandan. Taro. 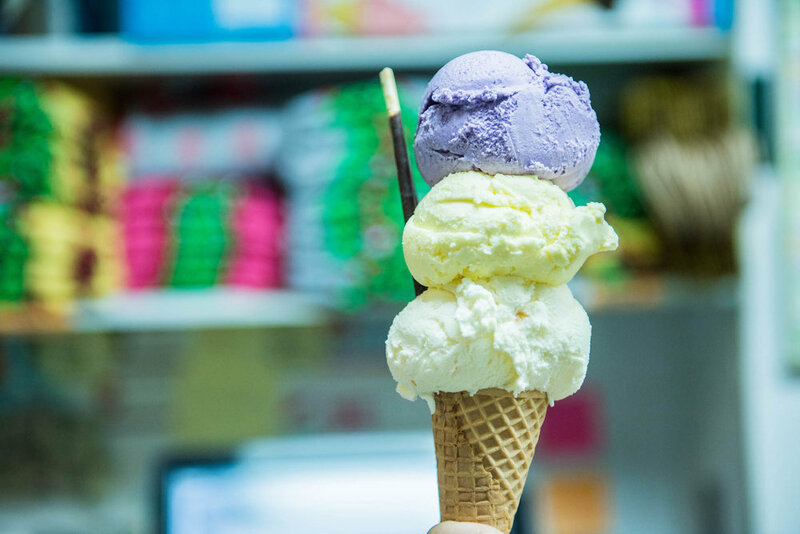 These are just a few of the dozens of flavors that reside in NYC Chinatown's Original Chinatown Ice Cream Factory. 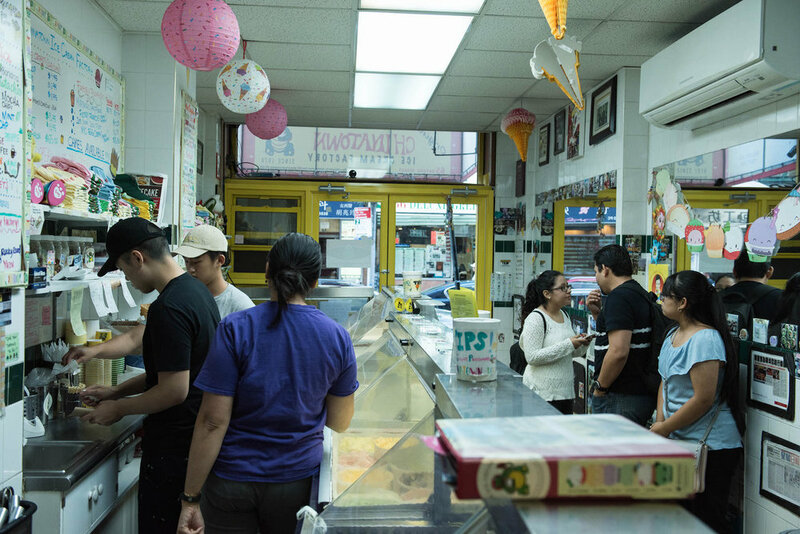 Tucked in a small alley just shy of Canal St., the humble ice cream shop has been serving frozen treats for over 40 years and introducing New Yorkers to the exciting flavors of Asia since its genesis. The founder, Philip Seid, has passed operations onto his daughter, Christina, who runs the shop with an incredible amount of charm, efficiency and warmth. She's constantly checking everything and knows every facet of the business. Even during our interview, she somehow managed to help serve five ice cream fans. With the recent launch of a branch in Flushing, NY, Christina is set to put her own spin on her father's shop, while staying true to her roots. 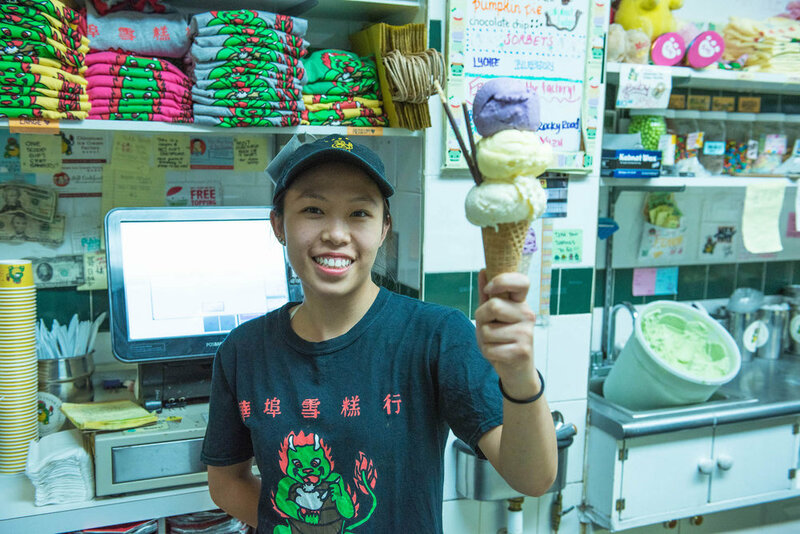 Get the scoop on Christina's journey at the Original Chinatown Ice Cream Factory. Photos by George Ko. Video edited by Sharon Choi. Giant Robot: How did your father start Chinatown Ice Cream Factory? Christina Seid: Father started the ice cream shop in the same location where he had a failed business. It was originally a cafe with a liquor license, but the neighborhood wasn't ready for it at the time. So he converted it into an ice cream shop. The late ’70s was when all the big ice cream shops started taking off – Haagen-Dazs, Ben & Jerry’s, etc. – so it just seemed like the right move. GR: How did he learn how to make ice cream, considering it’s not a traditional Asian dessert? CS: The Chinese are accredited as being innovators in ice cream, did you know that? GR: For shaved ice, yes, but they didn’t work much with dairy. CS: That’s true. My father started by reselling Shriver’s ice cream, which is an old-school American brand, but then we began to make our own. Before the Internet, he used the yellow pages, and a lot of asking around. He was a very inquisitive person. He just figured things out; even this very floor he laid down himself. He never had formal training. Nowadays, everybody needs to take a course and get a certificate. Why not just figure things out? I'm a third generation New Yorker. Both my grandfathers came over as children. My grandfather on my father's side settled on Hester St., which is considered a little bit like Chinatown, but it's more Little Italy. And my grandfather on my mother's side came to Queens. During the Chinese Exclusion Act, they went back to China to get wives, because there were no Chinese women here. There was no real Chinatown; it was only about a block long. People always think I would be spoiled because I'm a third generation American, but it's the opposite. My grandparents immigrated at a time when they had so little money. They came out of starvation, and when they had their children, all my parents knew was poverty. They taught me money management and how hard is it to make a dollar. Whereas you see later in the immigration patterns, there's more educated Chinese – less of the desperation that my grandparents felt. 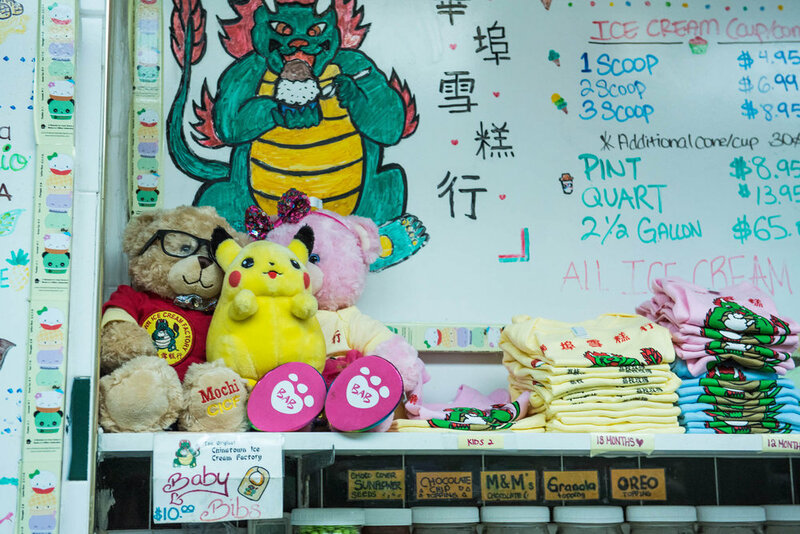 The Chinatown Ice Cream Factory has been run by Seid's family since the 1970s. GR: A lot of mainstream Asian-American culture thinks of Chinatown as being Cantonese, but there’s many Toisan around as well – including your family. CS: My grandparents spoke Toisan at home, so I understood the basics as a kid. It’s different than Cantonese; my parents describe it as more village-y, a little rough. My concept of being Chinese is also different, because there used to not be so many Chinese people. We thought of the Chinese together in one category. But as I grew older, I found there was a stigma with being from Toisan. A lot of people pretended to be from Hong Kong. But I think it’s cool to be from Toisan; you should be proud of where you're from. Toisan people are also known to be merchants, so it's very fitting. GR: Many Chinese peoples have always been considered great hustlers. CS: I think it takes hardship to rise above. And that’s what made my grandparents business people: when they came here, there were certain laws about what you were allowed to do, like operate Laundromats or cook Chinese food. It worked out long term in that I am in food, but not Chinese food per se. A lot of Asians haven’t settled here as far back as my family. Reading about the racism is different than experiencing it with your own kin. I used to wonder why the age gap between my aunt and my dad was so great, and it's because his mother couldn’t come to America, so she conceived my aunt in China when my grandfather had gone back to get married. Then he couldn't see them for a span of 20 years, so they had all the other kids right after his wife arrived here. Maybe 20 years is stretching it, but it’s something around there. GR: What was it like for your dad to open an ice cream shop in the ’70s? CS: I can only speak through my lens as a kid, and it was opened two or three years before I was born. Back then, Chinatown was very different, even as I was growing up. It was much more rough. New York City and Manhattan weren’t hip. There were no hipsters, high rises, or Manhattanites that wanted to share an apartment. GR: I’ve read that gangs would operate out of Chinatown. CS: They’re still around; it’s probably more with the newer immigrants now, like the Fujianese. I draw this parallel because my father likes movies like West Side Story. 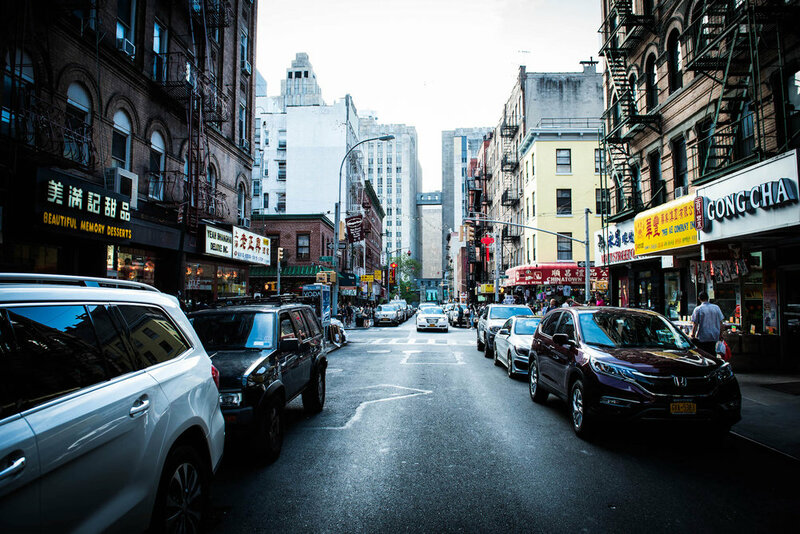 He was one of the first Chinese in the area, and he would get beat up by the equivalent of the Sharks and the Jets – so the Italians and the Hispanics, because we're talking about the Lower East Side and Little Italy. As time went on, it started to be more race-on-race crime. More Chinese moving in was a difficult thing to handle. With a small business, every day you got drama, literally life and death drama. I really commend my dad for sticking it out, because gangs were out to kill my family, and we were maybe the only people who stood up to them. GR: What was it like growing up in the ice cream shop? It sounds like a kid’s dream, but maybe that wasn’t true. CS: It’s a child's dream but a child's nightmare at the same time. I grew up in the suburbs, so I didn't want to go with my dad to work. I wanted Saturdays and Sundays not stuck behind the counter and scooping ice cream and cleaning floors. But I understood we were strapped for money, though at the same time I had some resentment because I didn't want to be here. I did bond with other kids in the same predicament as me. When you have a small business, the bonds you make lasts a lifetime. You never really talk to your house neighbors. But when you're bound together by business, you are always together, no matter where you move. GR: What are some of the relationships you developed? CS: Two doors over there was an herbal shop, and they closed after 30 or 40 years. But their son wound up marrying my high school classmate, and since we all have children and live around the same area, our kids play together. When you go to Columbus Park, you end up hanging out with the same people who go there. In Chinatown it’s really the space that brings you together into those relationships. Customers wait for their ice cream at the original Chinatown Ice Cream Factory shop on Bayard Street. GR: What lead you back to the ice cream shop after college? CS: “Lead back” is a strong statement; I feel like I was always here. In college I had to come back during breaks. And as I grew older, the store got busier. So I was allowed to go away to college, but I had to come back in the summer, and during all the winter holidays. In graduate school I picked a teaching because it was flexible and I love kids. But then having two jobs between that and the ice cream store burned me out, so I decided to focus on the store. GR: What has it been like as an Asian American woman running a small business? CS: I talk about this with my father often. I think when people imagine me, they think I’m happy all day, that I live behind the shop doing a feminine job and I don’t have issues being an Asian woman. But there are so many problems when you’re a business owner and an Asian woman. I deal with the same issues that Asian women would deal with if they were in corporate America, or in the kitchen. Even when I want to have work done on the store and I’m dealing with construction workers – think about how girls feel when they get their car fixed. There's always that stigma that women are weaker or that people can take advantage of you. GR: Is there anything in particular that you’ve struggled with? CS: I think I try to have a positive outlook on it, and find a way to get around things. I want to feel like the bigger person by circumventing the situation. One of the things gangs do is stand in front of your store, which is very annoying because they're blocking out business; they're trying to show they dominate your store. If my dad talks to the gang kids it's man-to-man and I worry that they'll get into some sort of confrontation. But as a woman or young girl, I don't think they saw me as a threat. How do you deal with that when you’re small? If I called the cops my dad would have to come out. But most of the time when you ask they’ll actually just go. So I think there are ways to play the girl card to your advantage. GR: I heard you’ve also written some children’s books. CS: I’ve written one and I'm working on a second one. The first one is about the experience of coming in Chinatown. I remember that my favorite book growing up was about this kid that played with the panda. But I had nothing in common with the kid, and I don't remember what the story was about. I just knew the kid looked similar to me. I didn't want that to be the only thing people could relate to. When people come to Chinatown, so many times behind the counter they people ask me where I learned to speak English. People have a false understanding of what Chinatown is like, so the book is a story about going to high school, going grocery shopping, just things that people could identify with as a normal kid. It’s not about playing with pandas or wearing qipaos. My second book is going to be about ice cream, but with math. So there's nothing necessarily Chinese about it, except that the characters are Asian. GR: I think that’s something many Asian Americans felt growing up – we just wanted to see someone who looked like us. Having that kind of reaffirmation, identity-wise, is so important. Do your own children come to the ice cream store with you? CS: Well, my first daughter is four and my second daughter is only one. But my first daughter definitely wants to continue the business – so the Ice Cream Factory is safe, for now. When she’s with her friends on the playground, they say things like, “I'm going to be a fireman!” But she says, “I'm going to make ice cream!” She’s really proud of her mom, without me pushing. Employee Carol Yu shows off a triple-decker cone decorated with Pocky sticks. GR: How did you come up with all the different Asian flavors? CS: My dad doesn't give himself enough credit; he’s very shy. Haagen-Dazs claims they were the first to create cookies and cream. But cookies and cream is so boring. If they created that in the late ’70s, can you imagine how novel mango and green tea leaf were? When I was growing up, people didn’t even know what a mango was. I had to explain it to them. And before green tea went mainstream through Snapple and Arizona Iced Tea, people would ask what it was. But my father was confident that if the flavors were delicious, it would connect cultures. I think he was ahead of his time, as someone around before food TV. GR: Even when Yogurtland popped up and introduced green tea froyo in non-Asian cities, it created culture shock. For your dad to think of those flavors that early on is incredible. CS: It is very cool. At the same time, when you introduce people to something new they’ll ask, “Why are you so weird?” There's an element of shame. Then when you finally are successful, it’s like, wow, that was really delicious. GR: When did you start seeing that happen? How did the store get so packed? CS: I don't think it just happened. I know with Instagram, it happens to some places. But we try to shy away from that. We're no-frills and we've built up our customer base over many years. We sell a ton of ice cream cakes. When I was little I would ask, “Dad, why are you rushing to work today?” And he would say, “Because somebody might pick up their cake at 11 o'clock. And you don't want to let them down for their cakes.” That’s dedication. When you have a history of being reliable, delivering an amazing product, quality control, customer service – that’s what people really want. It sounds cheesy, but it's hard to deliver those things. 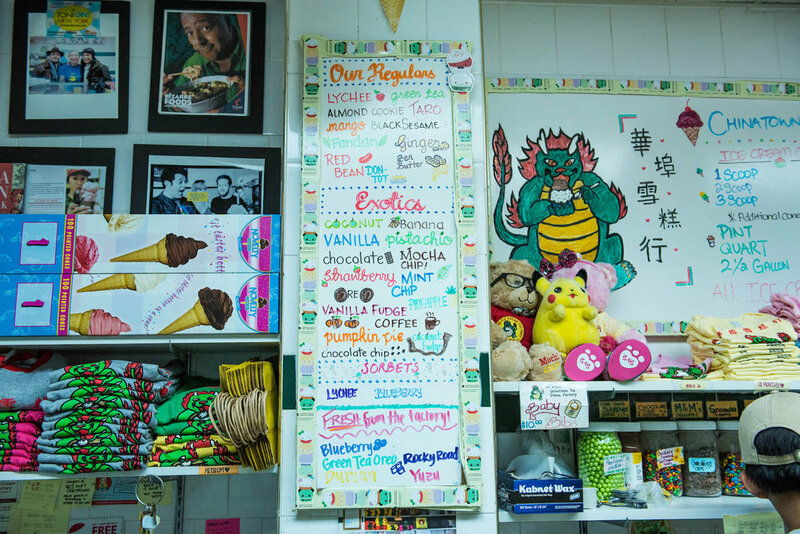 The menu board at Chinatown Ice Cream Factory is designed to invert people's conceptions of standard and exotic flavors. GR: What is the humor behind the menu board – how did you start classifying basic flavors as “exotic,” the way white people talk about Asian foods? CS: We did that as a joke by switching up the menu boards for exotic and regular. People asked, “Did you make a mistake? Vanilla’s not exotic.” But it’s about what is exotic to me, and what’s regular here is the mango, or sesame – that's what people come here for. There are some people who come here because they think we have the best vanilla. But I think our staples are the Asian flavors. GR: Who is the most special person who has visited your store? CS: Bethenny Frankel from The Real Housewives of New York City came in. She’s not necessarily the most famous person, but I heard from her production team she wanted to film here because she loves our store so much. Our employees are young, part of the Youtube generation, so they don't recognize her. They don't know who she is, but she comes in on a regular basis. When she came in with Carole Radziwill, all she would say is, “Oh, I love this place!” It's cut out of the clip, but she kept saying that. Everything in New York is Instagrammable, and there's something new on every block. For her to have that experience as a regular person – for our staff to give her that tasting experience, and have her respond that way – that was touching. She's so rich, she could eat at any place she wants, but she loves our store. GR: Well, your shop uses such fresh ingredients; I remember the first time I tried the durian flavor it tasted like real durian! Where do you get these ingredients? CS: It depends on the flavor. We're considered ultra-premium – that mean the highest butterfat content plus the highest quality ingredients. For the lychee flavor we puree real lychees. For the almond cookie flavor, we get almond cookies from the bakery that's been around the corner for 40 years. And the red bean flavor my grandmother started cooking a long time ago, so we continue that tradition. GR: What are the flavors you would recommend someone to try, if it was their first time at the store? CS: Lychee is the number one seller. Almond cookie because it’s my favorite. Taro is very in right now; a lot of people are claiming credit for what we've had since before bubble tea came to Chinatown. And pandan, since they call it the vanilla of Southeast Asia. GR: What’s next for the store? Many famous restaurants are expanding and sometimes suffer, but I feel like you’re committed to maintaining the quality of one shop. SC: Yesterday we were filming with Vice, and the host was about ten years younger than me. Younger people, especially men, always say things like, “I want to have 10 stores.” But the host wasn't as aggressive as I thought he would be. He’s a second-generation ice cream shop owner, and he claims that he still scoops there with his dad, just like I scoop here with my dad. Like me, the host didn't want to change too much. If you have 10 stores you’ve supposedly achieved something. But it's not that special; I don’t need to have headaches over 10 stores that could go south. Chinatown Ice Cream Factory is located at 65 Bayard St, New York, NY 10031. Their new branch is at 41 College Point Blvd, Flushing, NY 11355. You can contact them at (212)-608-4170. Do You Know the Donut Man? Copyright © 2018 Giant Robot Media, Inc. All rights reserved.